Brushfield Street, Spitalfields. A large lamp post and a pastiche pub. Seasons greetings people... I am back in the room having let this slip for a while. I hope you've had /are still having, a nice Christmas. This was just going to be about the lamp post but something else has evolved. On the corner of Brushfield Street and Crispin Street, E1, there is a lamp post with an extra large base that has hinged doors on two sides. Perhaps these spaces could have been used for storage or, more likely, for access to wires within and this could have been the junction box for the lights in this vicinity...? There are logos/emblems on the outside that include the letters 'B.W.' and 'W.D.'. And there is a depiction of a castle-type building which looks a bit like the the Tower of London. Can anyone enlighten me as to its original use ? As you can see from the montage above, the lamp post sat outside The Gun public house. TI say 'sat' as in past tense because the 1928 pub was demolished a few years ago along with most of The London Fruit and Wool Exchange. The Gun was a proper locals and local workers community centre – just what a pub should be – see here for an account of the pub's last days. Well, last weekend, whilst leading one of my walking tours around Spitalfields, I stopped in my tracks when I saw that a new drinking establishment has recently opened up on the same site. Peering in through the windows, it looks to me like a swanky American hotel bar; all shiny stuff and padded cushions,. But the really annoying, gob-smackingly-insensitve thing is THE NEW PLACE HAS BEEN GIVEN THE SAME NAME! I expect the old pub landlords must be even more vexed than I am. Grrrr. 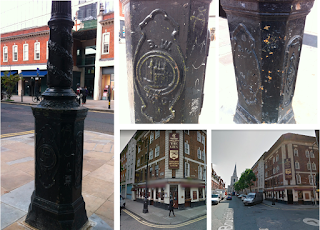 I suggest you compare the type of pub you see in the pics on the Spitalfield's Life link with what's there now to see what kind of customers this area of London is now trying to attract. I took no pics of the new place. Go see for yourself. But do not go inside. Anyone who tells me they have been in there and purchased something will be crossed off my Christmas card list. A while back I made mention of the marvellous ladies' toilet interior at The Duke Of Sussex pub near Lower Marsh (which I am pretty sure have since been renovated, boo hoo). Well, tidying up my photos this week I found this snap I took of another lovely evocative sunshine yellow toilet room at The Shakespeare's Head, just behind Saddlers Wells. Has anyone spotted any other time capsules like this? Some people read chick-lit, others read crime thrillers. Well I read a lot of old street directories to see how our streets have changed over the decades. It's a good research tool for my guided walks. Earlier this year whilst perusing Kelly's 1888 listings I noticed that Judd's of No.123 Holloway Rd was listed back then and was still trading in 2018 which made it, in my estimation, the oldest shop on the street. This business, located a few doors down from St Mary Magdelene, would have been the 'go to' local shop for headstones and stone monuments. I can find no reference or archive photos showing how the shop used to look in its Victorian heyday. It's disappointing to me that 150 years ago it would have probably had a marvellous shop front with carvings and gildings. Over the years any elaborate signage and display elements have been removed and replaced with this boring, ubiquitous, plate glass and perspex flat frontage. You'd at least expect to see something that says, "Established [year]" on there. So I hunted for info and discovered an article from July 2018 which probably explains why the shop has closed. Whether the report is true or not it's such a shame that Thomas Judd's descendants got into such a financial mess. I will now have to find another candidate for longest-serving-still-open shop on Holloway Rd. It's probably Selby's.